Red Hat Ladies - Stained Glass Wow !! 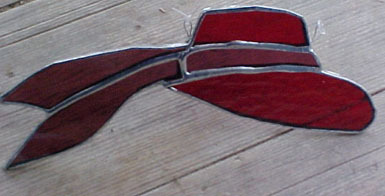 $50 This red hat sun catcher measures about 7.5 inches by 6.75 inches. It has a dark purple sash. It is made of real leaded stained glass. For that fun red hat lady in all of us. Custom Orders Welcomed! Designed by Johnna. Copyrighted @2004 Made with 60% leaded solder. $40 This red hat suncatcher measures about 7.5 inches by 5 inches. It has a dark purple sash. It is made of real leaded stained glass. For that fun red hat lady in all of us. Custom Orders Welcomed! Designed by Johnna. Copyrighted @2004 Made with 60% leaded solder. 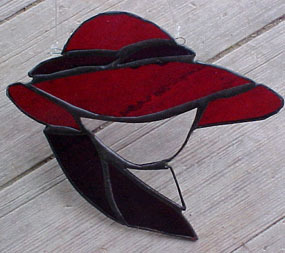 $25 This red hat sun catcher measures about 7.5 inches by 3.75 inches. It has a dark purple sach. 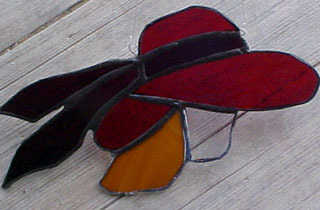 It is made of real leaded stained glass. For that fun red hat lady in all of us. Custom Orders Welcomed! Designed by Johnna. Copyrighted @2004 . Made with 60% leaded solder.